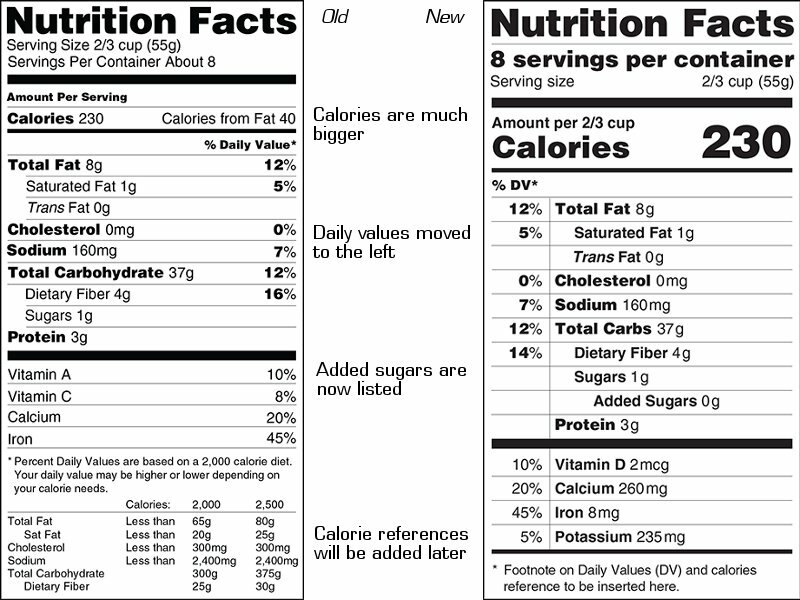 FDA Changes Nutrition Labels: Good Or Bad? For the first time in two decades the FDA wants to overhaul nutrition labels and place emphasis on calories and sugar. Will it help? When I first looked at them, the changes seemed unremarkable, but closer examination revealed some striking differences between the old and new food labels. To the left is the label as countless Americans see it every day. To the right how it will look if the FDA goes through with this. So how much sense does all this make? To me there are some ups and downs with the redesign. That, I think, was a very good idea. Tons of fad diet try to prove otherwise, but when it comes to losing weight, total calories are what matter. Dropping the “calories from fat” is therefore no big loss. What always confused me as a clueless German about American food labels is the arbitrary “serving size,” because it makes it hard to compare absolute values. Let’s take the FDA’s example, where it’s “2/3 cup (55 g).” What if I wanted to buy the same food from a different company and compare the calories on a one-on-one basis? If the second company stated the serving size as “1/2 cup (82 g)” that would require some pretty good arithmetic skills or taking a calculator along to your grocery shopping. Here in Germany manufacturers state a serving size as well, but also a “per 100 g” value. That lets me directly compare when deciding between two products. Before I once more sound like a snobistic European: the US is still ahead in nutrition labeling. Although many companies do it voluntarily, in Europe it’s still not even mandatory to put the information on products. Does listing “added sugars” make sense? Some foods naturally contain sugars, others get some on top, if the producer deems them not sweet enough. It makes no difference to your body: a carbohydrate is a carbohydrate, a calorie is a calorie. It seems the FDA paid a bit of lip service here to the “sugar is evil” crowd. Last but not least, the “daily calories” currently missing from the bottom of the label. If it was up to me, they should declutter the label and leave them out. Because, on the one hand, stating how many calories you should eat per day was a good idea. The values also were fairly realistic (2,000 and 2,500 kcal). But on the other, it was never of much help to those who needed it the most. Many people are frighteningly good at ignoring how many calories they eat. So what do you think? I’m especially looking at my American friends here, for whom these labels are part of their daily reality. Does it make things easier? Does it make more sense? Or should the changes have been entirely different? Picture courtesy of the FDA. Overall it looks like a step in the rght direction. We do the per 100g comparison too, which I find easier. No real difference to me. I worry more about what’s on the front of the package. I bought some salt-free peanuts in the shell recently. In large print on the front it said, 1) A no cholesterol food. Unless there are animal products in there, there is no cholesterol. 2) Packed with protein! Well actually, it’s packed with FAT, but I guess they don’t think that much honesty is good.